Dr. William E. (Bill) Galloway is a very worthy recipient of the Doris Malkin Curtis Medal. The Curtis Medal recognizes geologists for their career contributions in the development of new concepts for understanding the geology of the Gulf of Mexico Basin and other basins globally. Dr. Galloway has advanced international geoscience in general and the geology of the Gulf Coast in particular. Throughout his career, Dr. Galloway has made major contributions to fundamental geological concepts and models and to teaching and continuing education in the geosciences, as well as given generously of his time and wisdom in advising and mentoring students. His positive impact on the geoscience community has been, and will be, felt by generations of geoscientists to come. Bill was born in Waco, Texas, in 1944. He received his B.S. in Geology from Texas A&M University in 1966, and M.A. and Ph.D. in Geology from the University of Texas at Austin in 1968 and 1971, respectively. His professional career began in the oil patch in 1970 as a research scientist with Continental Oil Company in Ponca City, Oklahoma. After 5 years with Continental, Bill took a position as Research Scientist at the Bureau of Economic Geology, the University of Texas at Austin, in November 1975. From that time until the present, Bill has held various joint appointments between the Bureau of Economic Geology, Institute for Geophysics, and the Department of Geological Sciences at the University of Texas at Austin. 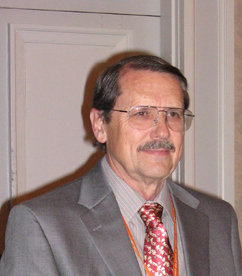 He is currently the Morgan Davis Centennial Chair in Petroleum Geology, Emeritus, in UT's Department of Geological Sciences. He has been a visiting professor at the University of Oklahoma, University of Bergen, and University of Adelaide. In addition to his Gulf Coast research, Dr. Galloway has investigated clastic depositional systems, stratigraphy, and basin-fill history in the North Sea Basin, Northwest Shelf Australia, and elsewhere. Bill claims to be retired but is still at the UT Institute for Geophysics at least one day a week. A traditional measure of a geoscientist's contribution to the science is publication numbers. Dr. Galloway has published more than 100 articles (excluding abstracts); 45 of those that Bill was lead author of involve Gulf Coast geology. He is co-author of the classic reference Terrigenous Clastic Depositional Systems, first published in 1983, with a second edition in 1996. Two of Bill's early seminal papers contributed to step changes in the evolution of sedimentology and stratigraphic concepts, both of which are still widely cited today. Published in 1975, "Process framework for describing morphologic and stratigraphic evolution of deltaic depositional systems," included the classic ternary diagram for the end member classification of deltaic systems on the basis of sediment input, wave energy flux, and tidal energy flux. This research was part of the transition within clastic sedimentology from process sedimentology and definition of specific depositional environments that dominated research of the 1960s to organizing those groups of environments into depositional system classifications in the 1970s. Bill's second seminal contribution came in 1989 with the paired AAPG articles, "Genetic stratigraphic sequences in basin analysis I & II." Many of us recall the great debates and discussions regarding the validity of the Frazier-Galloway model of genetic sequence stratigraphy relative to the Vail-Exxon model for depositional sequence stratigraphy. Gulf Coast geology figured prominently in Dr. Galloway's concepts of sequence stratigraphy, notably in the second of his paired 1989 publications, "Genetic stratigraphic sequences in basin analysis II: Application to the northwest Gulf of Mexico Cenozoic Basin." The value of contributions such as Bill's two publications just mentioned is that they establish fundamental concepts that stimulate discussions and further publication that lead to advancements in our science. In addition to his numerous topical publications related to the Gulf Coast, Dr. Galloway has published several synthesis articles on Gulf Coast geology that provide invaluable overviews and context summaries for any geoscientist new to the Gulf Coast. Notable among these is the summary of the Gulf of Mexico Cenozoic published by Galloway and others as Chapter 11 of the 1991 Decade of North American Geology volume (Salvador, Amos, ed., The Gulf of Mexico Basin, v. J). Bill's contributions continue today with his work as principal investigator of the Gulf of Mexico Basin Depositional Synthesis project (GBDS), an industrial consortium at UT's Institute for Geophysics. Bill's work at UTIG generated widely read summary publications such as "Cenozoic depositional evolution of the Gulf of Mexico Basin" (AAPG Bulletin, November 2000) and "Depositional evolution of the Gulf of Mexico sedimentary basin," (Miall, A. D., ed., Sedimentary basins of the United States and Canada, v. 5, 2008). Another measure of success in the geosciences is peer recognition of one's work. Dr. Galloway has received numerous professional and academic awards. His recent awards include GCSSEPM Honorary Membership (2002), AAPG Grover E. Murray Distinguished Educator Award (2004), University of Texas Institute for Geophysics Career Research Award (2009), and the SEPM Society for Sedimentary Geology Twenhofel Medal (2009). Past awards include Gulf Coast Association of Geological Societies Outstanding Educator Award (1993) as well as AAPG's A. I. Levorsen Memorial Award (1977, 1986), Distinguished Lecturer (1985–86), and Wallace Pratt Memorial Award (1983). Education is where Bill really shines. Bill has been an educator much of his professional career, both by teaching at the University of Texas at Austin and by conducting more than 100 industry short courses, core workshops, and field seminars. More important than all of the publications and awards mentioned above is the fact that Bill Galloway has had a major positive impact on many students and early-career geoscientists. I have known Bill in many capacities for more than 20 years: as my university professor and advisor, as a co-author, and as a colleague. Bill has the gift of teaching and a passion to share his knowledge. Given that geology is an experience-based science, this is Bill Galloway's greatest contribution. Not only is Bill a well studied and experienced geoscientist, but also his easy-going style and friendly personality have enabled him to be a most effective mentor. Bill's many friends and colleagues join in congratulating him on receiving the esteemed Doris Malkin Curtis Medal in 2012.